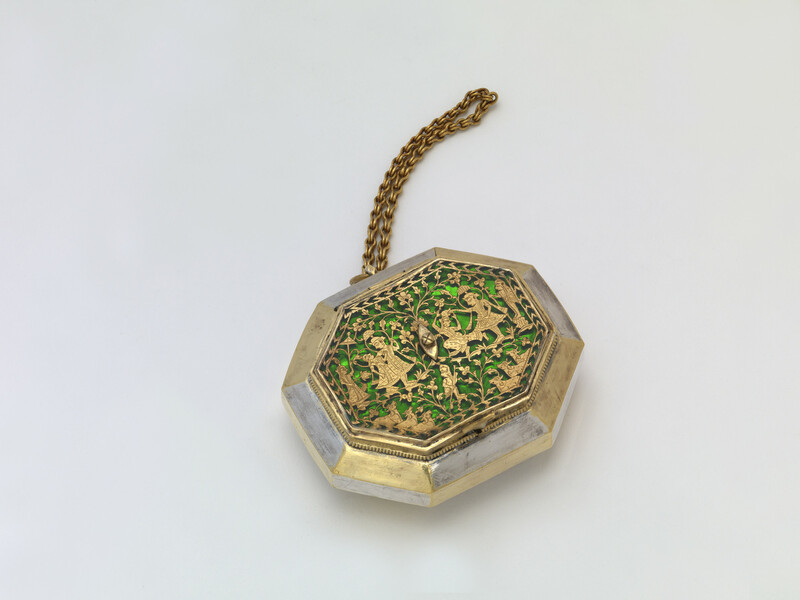 A silver-gilt octagonal opium box, with a plaque of pierced gold and green glass applied to the lid of the box. This technique used to make this decorative plaque, known as thewa (setting), originated in Pratapgarh (Rajasthan, India) in the late eighteenth to early nineteenth century. The process of thewa involves etching a design on a thin sheet of gold, removing the excess gold to obtain the desired image, and then fusing the pierced sheet onto coloured glass using heat. The plaque seen here depicts the Hindu god, Krishna with the gopis (cowherds). The underside of the box is decorated with a raised silver-gilt poppy head. The box hangs on a short gold chain. The distinctive silver-gilt decoration seen on the sides and underside of the box is often referred to as 'Ganga-Jumna' in northern parts of India. The term is inspired by the colours of the two main rivers in northern India: the River Ganges as silvery white and the River Jumna or Yamuna as muddied gold.